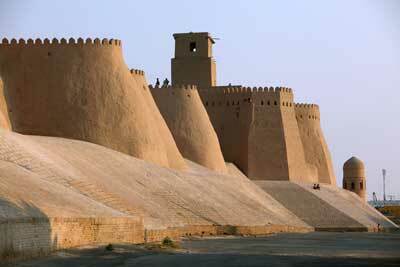 Kunya-Ark Citadel ('Old Citadel') abuts on Khiva's fortification wall next to Ata-Darvoza gate. 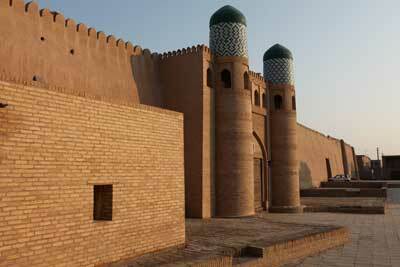 The citadel is the oldest remaining khan's residence in Khiva. It occupies a large area by the western wall of Ichan-Kala ('Inner Town'). The citadel was built in 1686 by order of Arang-Khan. It accommodated various fortifications, a gunpowder factory, an arsenal, a khan's palace, a court and some other structures. Over the ancient Khiva's Kunya-Ark Citadel, on the fortification adobe wall with two semi-turrets, rises a two-tier ayvan- a pavilion-like structure. It is called Akshi-Bobo ('An Old Man in Love') or, sometimes, Akshih Bobo ('White Sheikh'). Now it is hard to guess what gave rise to these names. Somehow or other, the names make one think that high behind the cogged walls a recluse was taking shelter. Tash-Khauli Palace Complex of Khiva's khans is one of the best examples of Asian secular architecture of the 19th century. The building activities on the site started in 1831 and it took the architects Tajiddin and Kalandar 10 years to complete the construction. Near Ata-Darvoza Gate, at the entrance to Ichan-Kala ("Inner Town") there is a small square that developed in front of the southern walls of Kunya-Ark Citadel. Here, the construction of Muhammad Aminkhan Madrassah was completed in 1855. Its majestic portal, two-storey arched outhouses and corner guldasta towers are covered with decorative majolica. 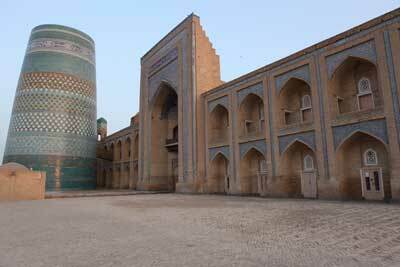 Among 20 Khiva's madrasah that have preserved to the present day, Kutlug Murad Inak Madrassah is the oldest. 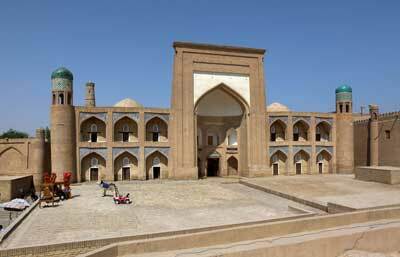 Every Khiva's ruler tried to inscribe his name upon the pages of history by building not only palaces and caravanserais but also mosques and madrassahs - higher Muslim schools. Kutlug Murad Inak Madrassah was built in 1809, during the reign of Khan Muhammad Rakhim I.
Islam Hojja Madrassah and Minaret is a peculiar architectural complex. The madrassah features a large domed hall and 42 hujras (rooms for students). 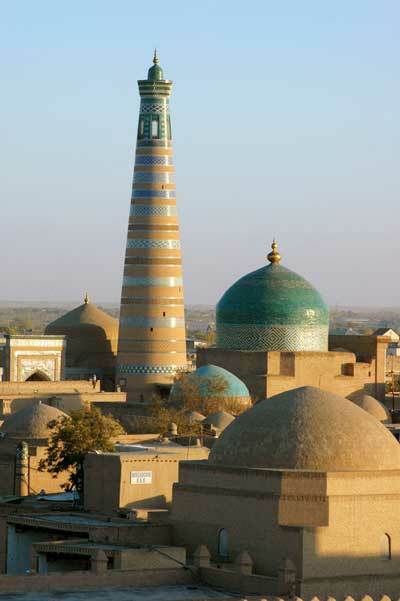 Next to the madrassah there stands Uzbekistan's highest minaret. 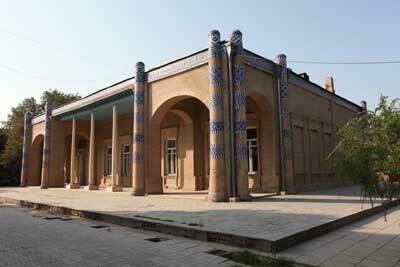 The history preserved the name of its architect – Usto Khudaibergen Hojji. 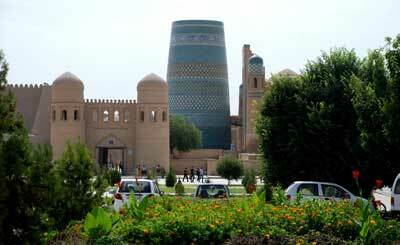 In Khiva there are up to 50 mosques and almost as many minarets. These towers, creating a fanciful and scenic townscape, seem to step to the modern life directly from the Middle Ages. The most extraordinary among them, at least in respect of its shape, is Kalta-Minor minaret, which means "short tower". Near Juma Mosque, inside a labyrinth of narrow streets, there towers a large turquoise dome with a kuba golden ball. This is the dome of Pahlavan Mahmud Mausoleum. The people have always honoured pahlavans - strong men. A genuine pahlavan deserved a legend of his own. Pahlavan Mahmud from Khorezm was the one who was given such an honour. He was furrier by trade, a hercules by build, a philosopher by spirit and poet by vocation. Around the hill with Kunya-Ark Citadel on top, there cluster many architectural monuments. The oldest of them is the sheikh Seyyid Allauddin's Mausoleum. 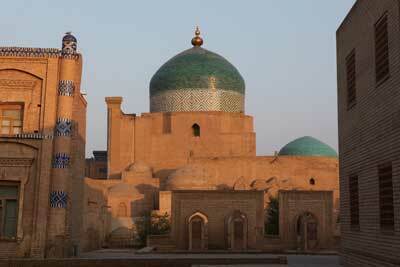 According to historical sources, the sheikh's disciple Emir Kulyal built this modest mausoleum in the 15th century. 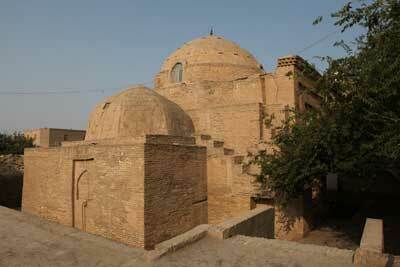 The mausoleum only structure that survived is gurkhona cubical building of the burial vault, made of burnt bricks. The western entrance of the mausoleum was decorated with a medium-size portal. The main Friday-prayer Juma Mosque stands out among numerous Khiva's mosques as having a design distinct from other Central Asian structures of its kind. Contrary to the tradition, it has no high portals, entrance arches and domes. It's a one-story building surrounded by a solid blank wall with three doors. 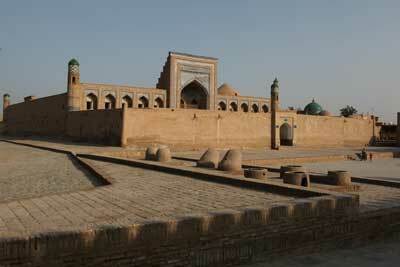 In Khiva time has spared about 50 ancient madrassahs and just a few khans' palaces. 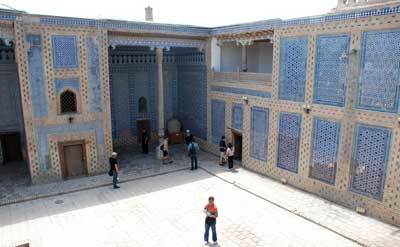 All of them are of certain interest to tourists since they vividly show the architectural tendencies characteristic of Khorezm over several centuries. It was Khan Muhammad Rakhim II, "a poet on the throne", known in Uzbek Literature as Firuz, who initiated the construction of Kibla Tozabog summer residence with its orchards and flower gardens. 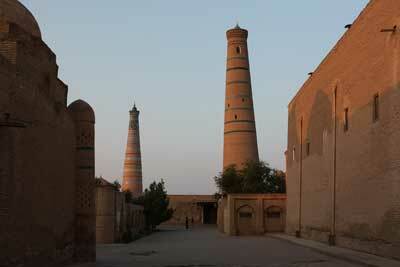 Dishan-Kala (Khiva's 'Outer Fortress') has a number of remarkable monuments. 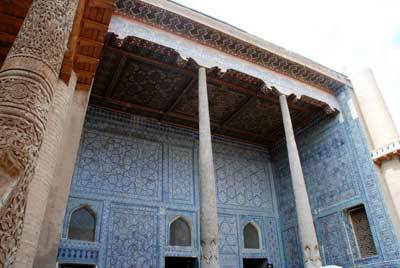 One of them is Nurullabay's Palace, whose foundations were laid by Muhammad Rakhimbay II in 1906. The construction of the palace was completed in 1912. 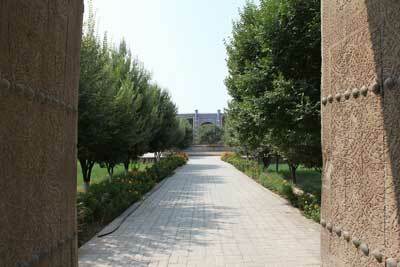 The palace complex has a few courtyards and gardens, a special chamber arz-khona where the ruler rendered justice, ceremonial and living chambers, and a reception hall.